[DC] – Today, partners came together to ensure kids across America can experience our national parks and public lands. The National Park Trust, The North Face, and the Outdoors Alliance for Kids joined the National Park Service to co-host an Every Kid in a Park event in Rock Creek Park for 50 fourth graders from E.W. Stokes Community Freedom Public Charter School. This is the second of five events funded by The North Face Explore Fund. 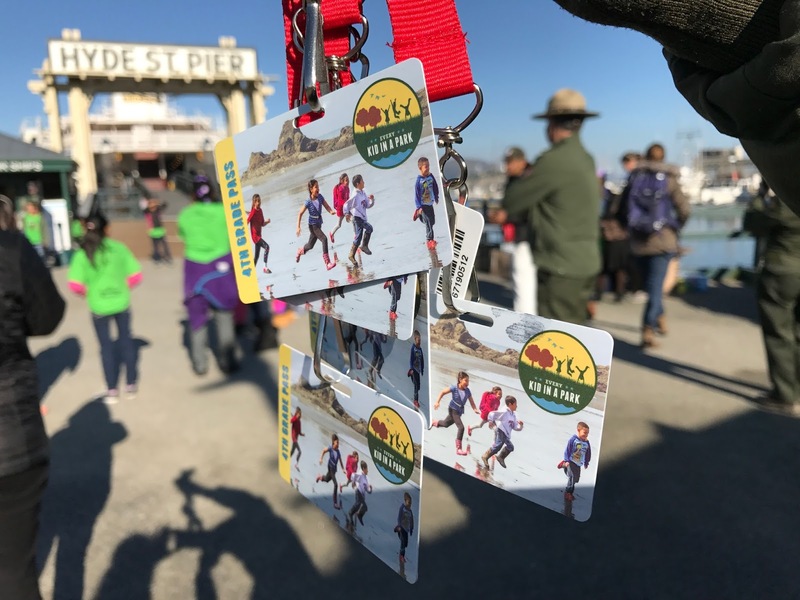 The students received free passes to America’s public lands and waters through the Every Kid in a Park initiative, which seeks to connect young people with the great outdoors by granting free entry to national parks for all fourth-graders and their families. “We were delighted to work with The North Face and the Outdoors Alliance for Kids to connect local 4th-grade students to Rock Creek Park where they experienced a fun-filled day learning about local wildlife, watersheds, and outdoor recreation — and the importance of enjoying and preserving these special places,” stated Grace Lee, Executive Director, National Park Trust. [New York City] – Today, partners came together to ensure kids across America can experience our national parks and public lands. 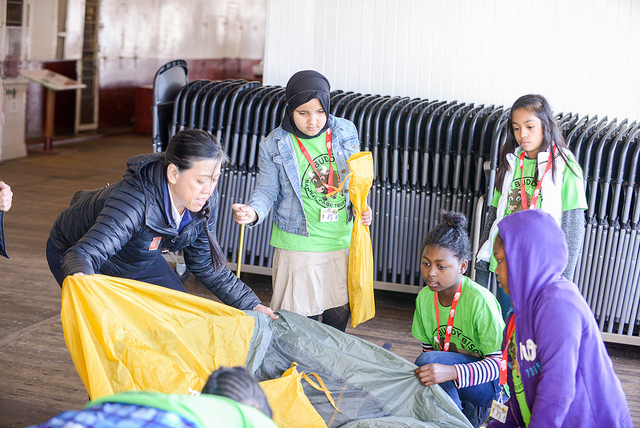 The National Park Trust, The North Face, and the Outdoors Alliance for Kids joined the National Park Service to co-host an Every Kid in a Park event in Gateway National Recreation Area for 90 fourth graders from Amersfort Public School (PS 119) in Brooklyn. This is the first of five events funded by The North Face Explore Fund. “We were delighted to work with The North Face and the Outdoors Alliance for Kids to connect local 4th-grade students to Gateway National Recreation Area where they experienced a fun-filled day learning about local wildlife, ecology, and outdoor recreation — and the importance of enjoying and preserving these special places,” stated Grace Lee, Executive Director, National Park Trust. About Gateway National Recreation Area: A large diverse urban park spanning two states, Gateway combines recreational activities with natural beauty, wildlife preservation, military history and more. Visitors can hike, picnic, swim, sunbathe, bike, visit the oldest lighthouse in the nation, see an airplane collection and camp overnight, all in the New York metropolitan area. Gateway is one of the ten most visited national parks in the country. For information about Gateway’s upcoming public programs, see the park’s website at http://www.nps.gov/gate. To join the conversation about Gateway, like us on our Facebook page: www.Facebook.com/Gatewaynps. NPT’s Buddy Bison Program funded to increase access to the outdoors for youth in 5 urban cities. Washington, D.C. – June 30, 2016 – In this Centennial year of the National Park Service, National Park Trust is pleased to announce that The North Face has awarded two 2016 Explore Fund grants to benefit our national Buddy Bison School Program. 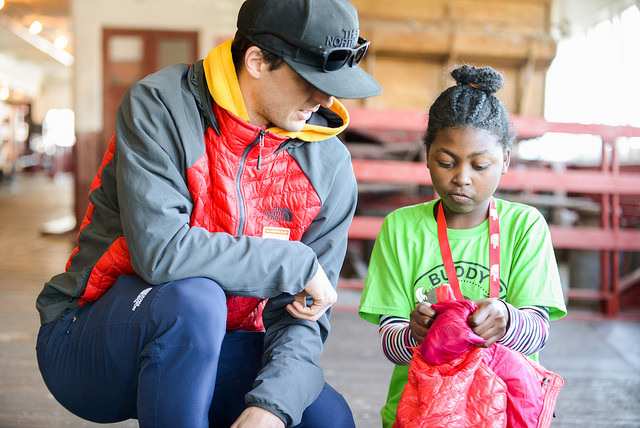 The Buddy Bison program was created in 2009 with the goal of getting kids from under-served communities engaged with our nation’s parks and public lands to experience outdoor recreation, education, and service opportunities. Currently 53 Title 1 public, public charter and private schools across the country — spanning grades 2 through 8 — are participating in the program. 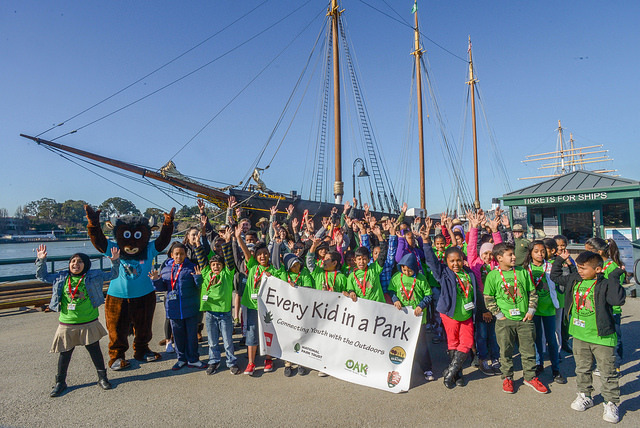 In partnership with the Outdoors Alliance for Kids (OAK), the first grant, Buddy Bison Gets 4thGraders Park-ing, will be used to kick off the second year of President Obama’s Every Kid in a Park initiative in 5 cities including Washington, D.C., New York City, Chicago, Boston, and San Francisco. OAK is a national strategic partnership of over 85 organizations from diverse sectors advocating for equitable and readily available opportunities for children, youth and families to connect with the outdoors. Fourth graders from Title 1 schools in these cities will participate in marquee events with The North Face, National Park Trust, OAK and alliance members and be welcomed into the Buddy Bison School Program with funds from the Explore Fund providing park trips to national parks that promote outdoor recreation and align with their school curriculum. The second grant, Buddy Bison in the Big Apple, will be used to engage children from K through 8th grades residing in homeless shelters in New York City. Dare2BNYC, a non-profit based in New York City that works to break the cycle of poverty and improve homelessness, will once again work closely with NPT to provide access to parks for these youth. For these students, the Buddy Bison program will emphasize not only outdoor recreation and education, but also career opportunities that support our national parks and public lands. Students will have the opportunity to participate in 4 park experiences and meet with career professionals that support the parks as well as volunteers from The North Face store in Manhattan. 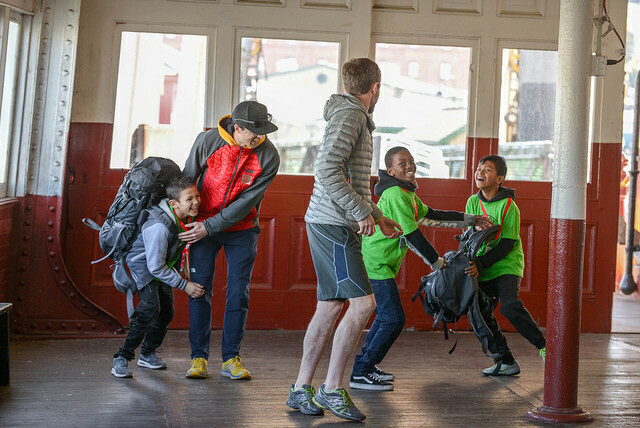 “As we approach the 100th birthday of the National Park Service, we are delighted to share the great news about our expanded partnership with The North Face to provide park experiences for hundreds of students from underserved communities. The Explore Fund will allow many of these students to experience their first park trip where they will enjoy fun outdoor recreation, and learn about STEM, history, park stewardship and career opportunities that support our national parks. ” stated Grace Lee, executive director, National Park Trust. Both of these grants will be used starting this fall and throughout the 2016-2017 school year. The North Face selected 45 nonprofits that engage their participants in opportunities that inspire a lifelong love of the outdoors. Selected programs use outdoor exploration as a catalyst for positive personal or societal change, to encourage participants to try new outdoor activities, and promote environmental stewardship values. As part of its mission to start a global movement of outdoor exploration, The North Face introduced Explore Fund (www.explorefund.org) in 2010 and the program has since provided more than $2.2 million in grants to organizations committed to inspiring people to explore the outdoors and care for the environment.